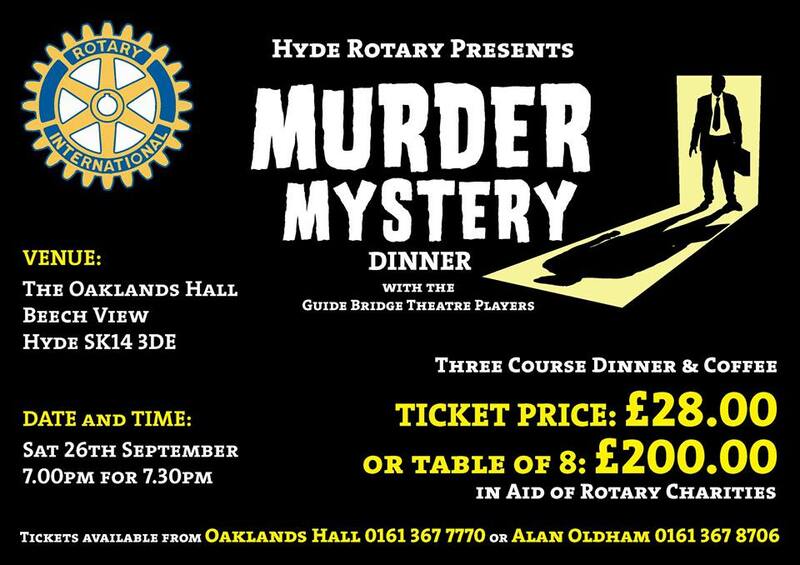 Rotary Club of Hyde - Welcome! 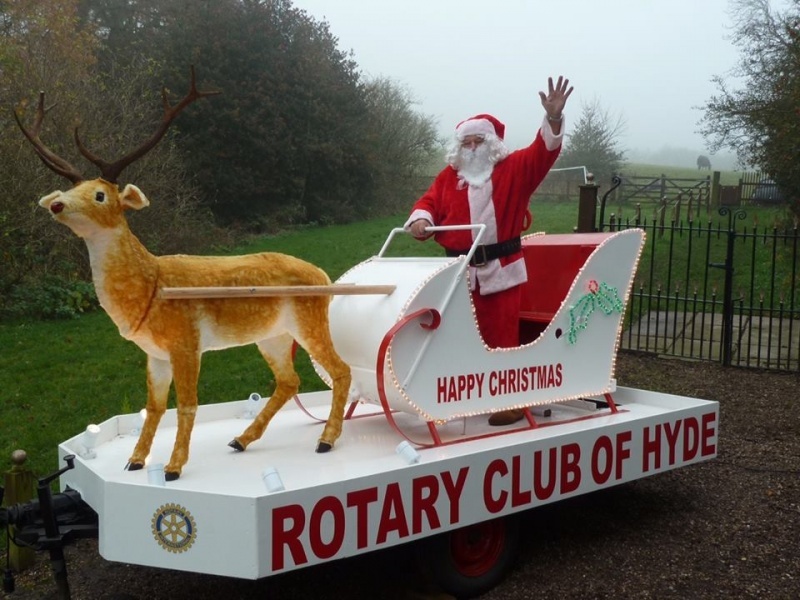 The Rotary Club of Hyde Christmas Sleigh and Father Christmas will be setting off on their tour of the various districts in Hyde between December 9th and 23rd. Father Christmas we will be visiting various locations supermarkets and superstores in the run up to the festive celebrations. Helped by the Rotary Club members and volunteers we will be handing out Christmas cards and sweets, The club will be collecting your change to help support local projects throughout the year, it also gives the children the opportunity to come out and ask Father Christmas for those last minute Christmas presents and if your lucky have a picture taken with Father Christmas. Hyde Rotary Club President Alan Oldham said i would like to encourage residents and children to come out on to the streets this festive period and get involved in the Christmas spirit and donate to our collection to help support the many local projects we will be supporting next year. Oaklands Hall Hyde 29th June 2017 New president Alan Oldham accepted the Presidential Chain of Office from outgoing president Kevin Maddox. 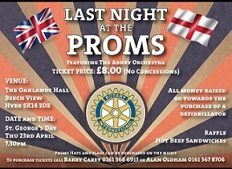 Last Saturday night Hyde Rotary staged their own version of The Last Night of the Proms in the prestigious surroundings of the Oaklands Hall. We could have gone on all night. Our thanks also go out to our guest soprano Sarah Kinsey who supported the band. The raffle on the night raised £230.00 thanks to everyone who donated prizes and total profits came to £871.00 that will be donated to The Tameside Macmillan Unit. Organizer Kevin Maddox said in my Presidential year the Macmillan unit is my chosen charity and it will give me great pleasure to hand a cheque too Rose Tipton Fund Raising Manager for the unit that will benefit residents in Tameside and Glossop. The Rotary Club of Hyde Christmas Sleigh and Father Christmas will be setting off on their tour of the various districts in Hyde between December 5th and 17th Father Christmas we will be viiting various locations supermarkets, superstores and the Hyde Artisan Market in the run up to the festive celebrations. Helped by the Rotary Club members and volunteers we will be handing out Christmas cards and sweets, The club will be collecting your change to help support local projects throughout the year, it also gives the children the opportunity to come out and ask Father Christmas for those last minute Christmas presents and if your lucky have a picture taken with Father Christmas. 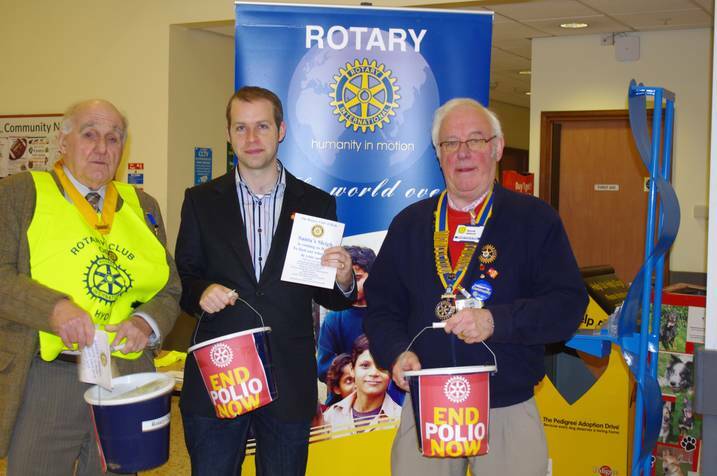 Hyde Rotary Club President Kevin Maddox said i would like to encourage residents and children to come out on to the streets this festive period and get involved in the Christmas spirit and donate to our collection to help support the many local projects we will be supporting next year. 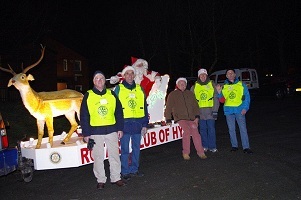 Hyde rotarians are dedicated to supporting food banks! Rotarians loaded the van with 30 crates of food and toiletries, destined for the homeless and disadvantaged of Manchester and Stockport. Kevin Maddox (President) said "all donations were gratefully received and we would like to thank everyone that donated"
The Club is in its 79th year and 50 guests including Kevin’s close family and friends and members from the Rotary clubs of Tameside and Glossop attended the dinner. 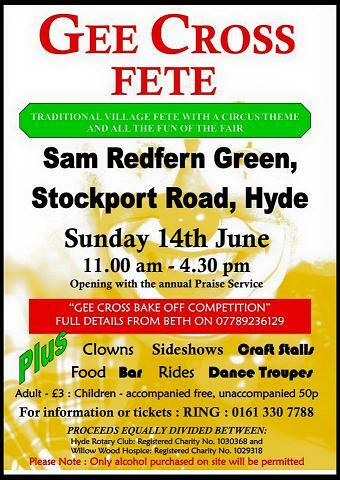 We are pleased to announce that this years Gee Cross Fete will be held on Sunday 12th June 2016! 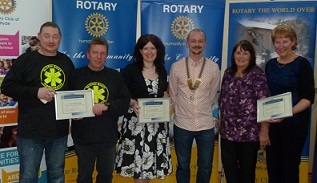 The Rotary Club of Hyde presented their Community Awards on Thursday 5th March at The Oakland's Hall in Hyde. The Awards are presented each year to members of our community who have given their time to make a difference within the local community. This year the club members nominated Louise Croombs from Tameside Radio, who has given up her time to help many community groups and projects within the borough over the last twelve months. Christine Frost from the Tuesday Club in Hyde that meets at Central Methodist Church every Tuesday Night, the group offers support and a social evening for people from Tameside and beyond who suffer with learning difficulties. The final award and a cheque for ï¿½250.00 was presented to Blood Bikes Manchester the local organization founded in 2012 offer a free courier service to the NHS delivering blood across the Greater Manchester area. Following the presentations President Aidan Gaunt said this is my favourite evening of the Rotary year, its always nice to reward others who work so hard within our community and are sometimes not recognised. Thankyou to our Xmas helpers! With Christmas now a fond wet memory and the sleigh put back into cotton wool, it was time to get our Christmas helpers together to treat them to a night out in the warmth of our local hostelry. President Aidan welcomed our guest then it was time to tuck into some real Lancashire hotpot. Following the food Kevin gave a presentation of all our photographs taken on route at Christmas. Then it was time to make a few presentations to our members, the clubs first mother Christmas award went to Vice President Lynn Bird who stood in on the first night when the big man was otherwise engaged,our second award went to Alan Oldham the golden bucket award, this is a prestigious award only presented when someone goes beyond the call of duty and attends each sleigh engagement Alan's thank you speech was short and sweet, never again Back to the business of the night we raised just under 3,000 at Christmas and it was time to put the money to good use President Aidan presented cheques to the guides from gee cross and our local Church St Mary's in Newton the funds will be used to aid projects within our local community . Church Newton on Sunday 14th December at 1.30pm. Disabled access, toilets and hearing induction loop are available at the church. SANTA WILL BE VISITING HYDE!!!! any other circumstances that are beyond our control. from Reubenï¿½s Retreat to the club. one million pound on the 1st August. from a life limiting or life threatening illness. for ï¿½ 250.00 by club president Aidan Gaunt. Parents and families in the future when this project is completed. Congratulations to our new President Aidan Gaunt. The Rotary club of Hyde celebrated Aidan's installation on 4th July 2014. 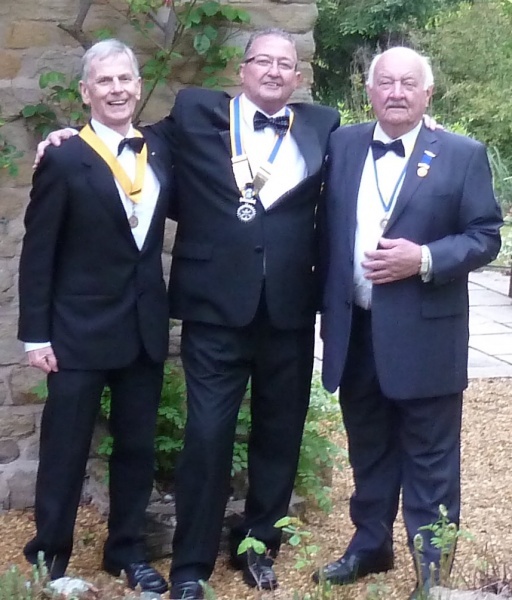 Pictured here is Past President Bill Goldthorpe, Incoming President Aidan Gaunt and Incoming Vice President Lynn Bird. THE annual Gee Cross Fete, organised jointly by the Rotary Club of Hyde and Willow Wood Hospice, celebrated its 21st year with another great success despite the unseasonal weather this year. 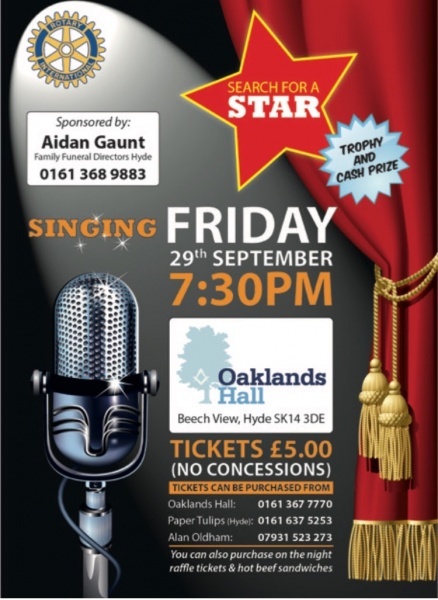 Over the years this event has been ï¿½re-inventedï¿½ a few times but has kept its local family appeal, providing local charities and organisation an opportunity to meet the people of Hyde and it is estimated will have raised over ï¿½150,000. The main attraction this year was the performances by Circus Sensible with their circus workshops being especially enjoyed. The fete included a large variety of stalls, games, a large raffle and entertainment throughout the day. The pony rides were a particular hit with younger children. The fete opened with the traditional church service which was followed by displays from Dowson, Holy Trinity, Leigh St and Godley Schools. Performances by the Freedom Dancers and MCA were also enjoyed by the visitors. For the first time budding Mary Berryï¿½s had the chance to enter the ï¿½Great GX Bake Offï¿½ with the first prize being scooped up by Lynda Byrne. 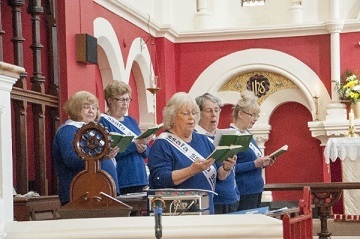 The event was honoured by a visit from The Mayor and Mayoress. Andy Williams from Hyde Rotary said on behalf of his club and the Hospice ï¿½Events like Gee Cross Fete take months of planning and the success of the event would not have been possible if it wasnï¿½t for the continued support of the local community. Thankfully this year all the hard work culminated in a successful and enjoyable day for the 3000 people who attended and raised over ï¿½5000 which will benefit both Rotary charities and Willow Wood. 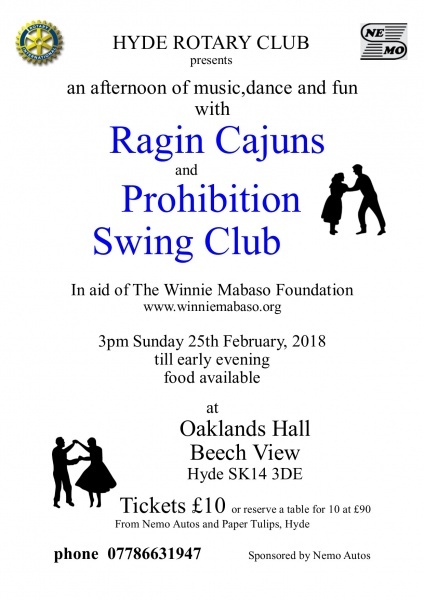 The money raised last year was used by Hyde Rotary Club to support the following organisations Age UK, Marie Curie, Oakdale School Christmas presents, Shelter Emergency Boxes, Union Street pensionerï¿½s party, Wish Upon a Star, End World Polio, plus many other worthy causes. Finally the fete organising committee would like to thank everyone, to many to mention individually, who made the day possible. Everyone who volunteered their help both in the run up to the event to helping on the day, local firms and individuals who either donated a wide range of raffle prizes or advertised in the fete programme and of course to all of the spectators who attended played a huge part in making this community event again a success. However the organisers would like to thank the Werneth Conservatives and Millson Architects for their event sponsorship and to Tameside Radio for helping to publicise the event. an arson attack at the Lower Bennet Street Community Centre in Hyde. for such a generous contribution towards our fund. The Rotary club of Hyde will be hosting a Know Your Blood Pressure event on Saturday 5th April 2014 at the Tesco store in Hattersley to help raise awareness of the link between high blood pressure and stroke across the UK. 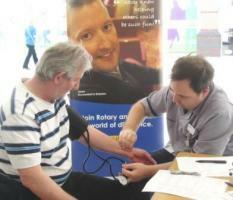 Hyde Rotary club is joining scores of clubs across the UK taking to the streets of Hyde as part of the Know Your Blood Pressure campaign in partnership with The Stroke Association and the Ambulance Service. The event will be taking place from 10.00 am to 4.00pm offering the public a free blood pressure monitoring service with information and advice on stroke related health issues. Traditional Village Fete with all the fun of a fair! For further detail please use "Contact Us"
Charity Golf Day in aid Willow Wood Hospice raised over ï¿½750. 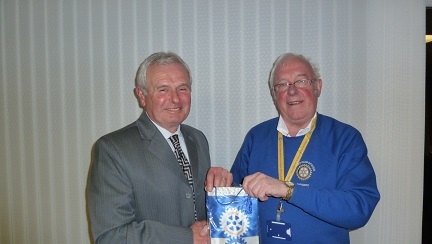 The Rotary Club of Hyde held their annual community awards evening at Werneth Low Golf Cub Hyde last Thursday night. The awards are presented to members of the community who have given their time to make a difference within their local communities. Charlie Fenton received the award for his services to local cricket at 92 Charlie has now retired from his umpiring duties in the Derbyshire and Cheshire league after 61 years service. 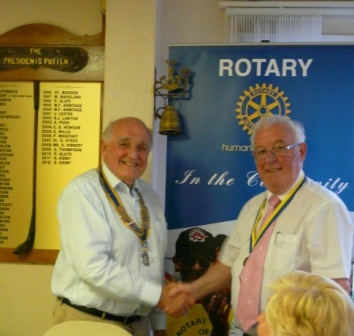 Rotary president David Bentley said after presenting the awards itï¿½s always a pleasure each year to meet people from our local community who devote their time to help others.